I have a lot of Astoria pride. 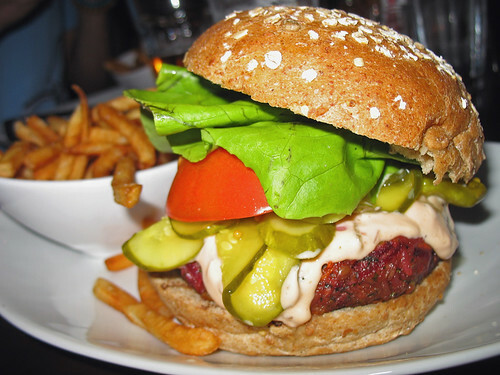 This is #2 in my Top Ten list of the best veggie burgers I've ever eaten. Seriously. It's an amazing lentil patty with pickled onions and horseradish sauce on a deliciously sweet bun. Everything else from this bakery is brilliant as well, so if you've been putting off visiting because it's a bit of a walk from the more central areas of Astoria, let me assure you it is worth the trip. Yes, 5 Napkin has locations in Manhattan as well... but it's become a pretty popular Astoria spot since it opened last year. And it's rare and awesome to find a burger place that gets tons of praise for its meat burgers but ALSO has a veggie burger equally worthy of such high praise! This one is #3 on my Top Ten list. 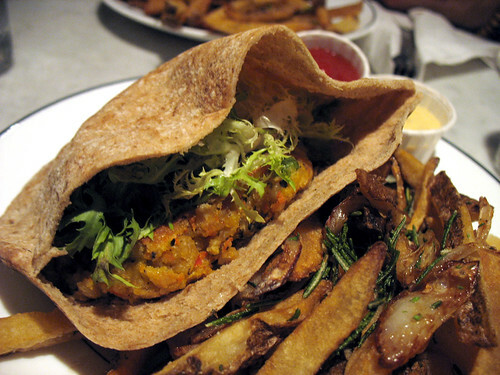 Don't let the pita fool you - despite the unorthodox bun, Sparrow's veggie burger is #7 on the Top Ten list. Richly-flavored and spicy, it's a delicious brunch... or dinner... or drunkfood (I think I've eaten it for all three occasions at various times). Of course I couldn't leave out Bare Burger, could I? This place has been such a hit in Astoria that it has now opened two (or more?) locations in Manhattan, and is opening a second Astoria location near Ditmars in the near future. Their veggie burger is hearty and satisfying - and with their extensive menu, you can choose from a variety of toppings so you'd never get bored if you wanted to come back and eat the veggie burger again and again... Which is why it's #8 on my Top Ten list too. A very recent addition to the Ditmars area, Just Burgers is another one of those burger joints that lets you choose from a long list of toppings to customize your burger. 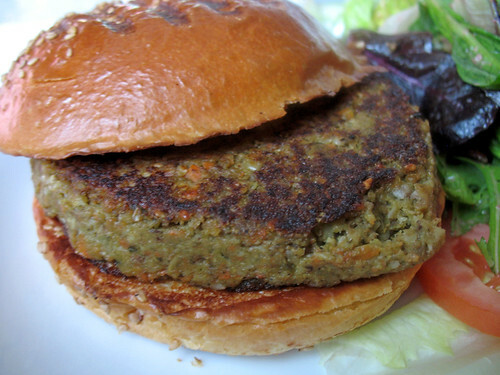 What makes them stand out though is their veggie burgers which are made from quinoa and fresh vegetables. 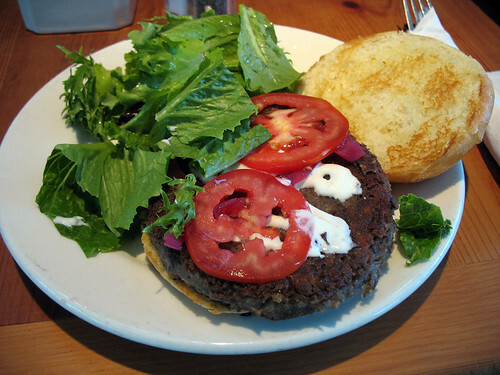 I'm surprised I don't see quinoa in burgers more often, because it's great! I'm always pleasantly surprised when fast-food-esque burger joints have good veggie burgers. 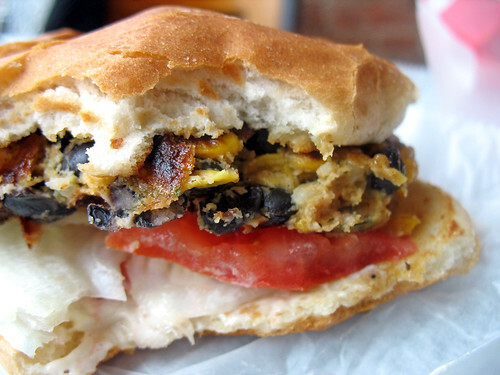 Petey's is fast, inexpensive, tasty, and I hear they have now added a third variety of veggie burger to their menu! (I have only tried the Southwestern so far). I came here for brunch one day and was pleasantly surprised to see a veggie burger on the menu - and a house-made one at that! Full of grains and delicious vegetables. I know there are still more veggie burgers in the neighborhood that I haven't reviewed yet... Blackbirds comes to mind (I have actually eaten their burger, and remember it being quite good, but that was back before I started the blog), and I hear the newly-opened EcoTable has one on their menu as well. 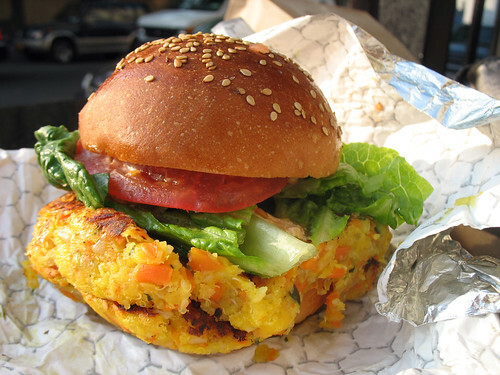 What's your favorite veggie burger in Astoria? Thanks to We Heart Astoria for the invitation to participate in this blog carnival! Click HERE to return to the main page of the Astoria Blog Carnival. All we can say is....yum! We didn't realize how many local eateries were vegetarian friendly, especially when it comes to burgers. 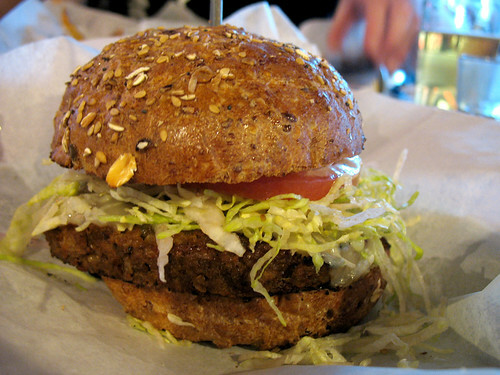 The veggie burger at Petey's looks really good...we're going to have to give it a try one of these days.